Benito Salgado, 33, and his children Benito, 9, and Stephanie, 7, at their house in Los Angeles, Calif., on May 31, 2016. Despite being aware of the risks, Salgado and his family do not have a disaster emergency kit. 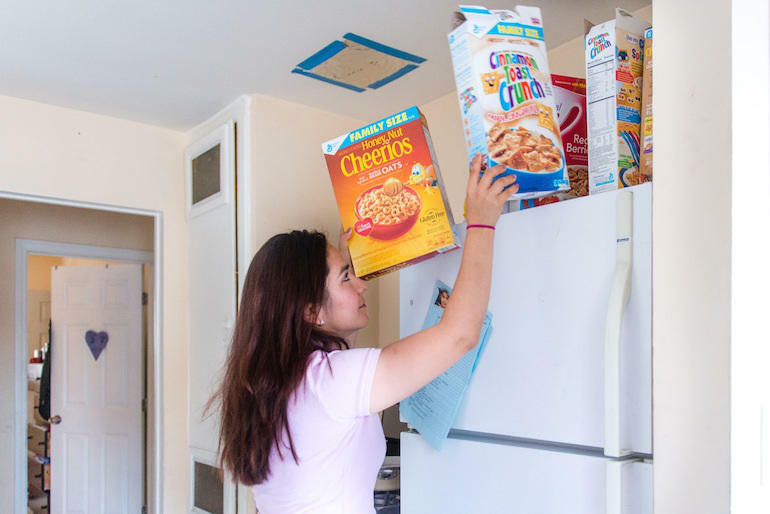 Sandy Roman, Benito Salgado’s wife, said they keep extra cereal around just in case they need it if disaster strikes. Only 38 percent of Latino households reported having a disaster plan, the lowest for any ethnic or racial group in the county. In Los Angeles County the question is not whether a major disaster will happen, but when. Experts expect an earthquake measuring 7.0 or greater in the next 30 years. The area is prone to wildfires, floods, and other natural disasters. Infectious disease outbreaks and terrorist attacks are also possible. Though aware of the risks, less than half of the population is prepared for such emergencies. Surveys show Hispanic communities are least prepared of all. Only 38 percent of Latino households reported having a disaster plan, the lowest of any ethnic or racial group, according to the LA County Department of Public Health’s Community Health Assessment 2014. 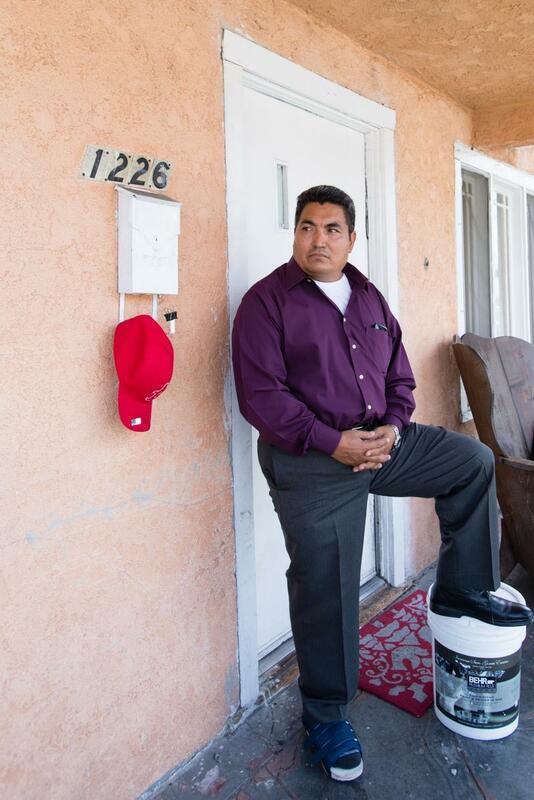 In a county of 10 million people where 48 percent are Latinos, millions could be left in peril. “We have water,” said Benito Salgado, when asked if his family was prepared. But that’s about it. Salgado immigrated from Mexico 11 years ago. 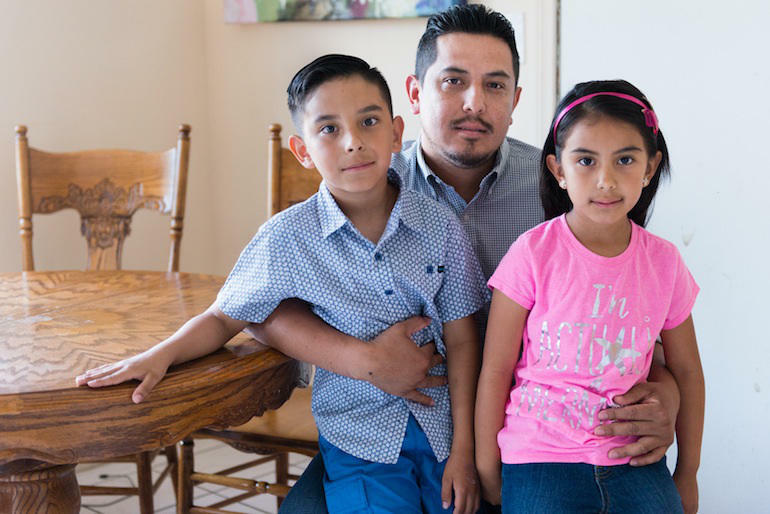 His wife and their children, ages 6 and 8, do not have an emergency kit — nor do nearly two-thirds of their East LA neighbors. South LA and East LA have the highest percentage of Latino residents — 68 percent and 73.5 percent, respectively. Those two districts are home to nearly 2.3 million people, and many are immigrants. They also have high rates of poverty. The central regions have more diverse and co-mingled populations. Coastal areas have mostly white residents who are more prosperous. The two most heavily Latino areas are particularly vulnerable to disasters. They have few regularly available services, such as health care and grocery stores. Geography is another reason: the Newport-Inglewood Fault runs directly beneath them. But social factors may be even more important, according to the Centers for Disease Control and Prevention. The CDC looks at several factors to determine how well an area might hold up during a disaster. t found that communities with residents of lower social economic status, racial/ethnic minorities and limited English proficiency fare more poorly. Who lives in the household also matters. Families with children, elderly, ill or disabled people, or ones led by a single parent, have bigger struggles. The type of housing (such as high-rises or older construction) and transportation also weigh on risk, the CDC said. Angelenos in South and East LA tend to have higher rates of chronic illnesses, less education and lower incomes. Latino households are often large and include relatives of all ages. It’s easy to see why South and East LA are at higher risk. Having a close-knit community makes a difference. People who share a sense of belonging to their neighborhood are more likely to survive. And, their communities tend to recovery more quickly after tragedy strikes. Government agencies and relief organizations, such as the Red Cross, are working to improve readiness among Angelenos, especially those at highest risk. They have programs to help build community connections and increase resources in Latino neighborhoods. For example, LA County’s Emergency Medical Services agency has a countywide disaster plan that includes communication systems in several languages. They also have emergency supplies stored in secure sites throughout the county. The Los Angeles chapter of the American Red Cross has a disaster plan called Prepare SoCAL that targets vulnerable communities. “To be prepared, four things are needed — an emergency plan, a kit, knowing where to get information and being involved in the community,” said Maria Melo Bueno, communications manager for the American Red Cross in Los Angeles. Prepare SoCAL works with faith-based groups, schools, non-profits and businesses that are already in a neighborhood. “Working with local groups is important because we’ve learned that after a catastrophe, people first reach out to someone they know and trust,” said Melo Bueno. The Red Cross also communicates with Latinos via Spanish-language media, including Telemundo and Univision. Radio will likely be the main source of information, since 97 percent of Latinos listen to the radio each week. Schools are important for helping children get prepared. “Last month, we completed aDisney Pillowcase Project in a Catholic school in East LA,” said Melo Bueno. School children are given safety lessons and pillowcases, donated by Disney. The kids can decorate the pillowcases and then fill them with essentials, such as water, food and a flashlight. Salgado’s children learned in school what to do in case of an earthquake. “They told us to cover our head,” said 8-year-old Benito, “and we have Band-Aids.” Salgado is glad the school taught his kids about earthquakes. He wants them to be safe in case he’s not there.